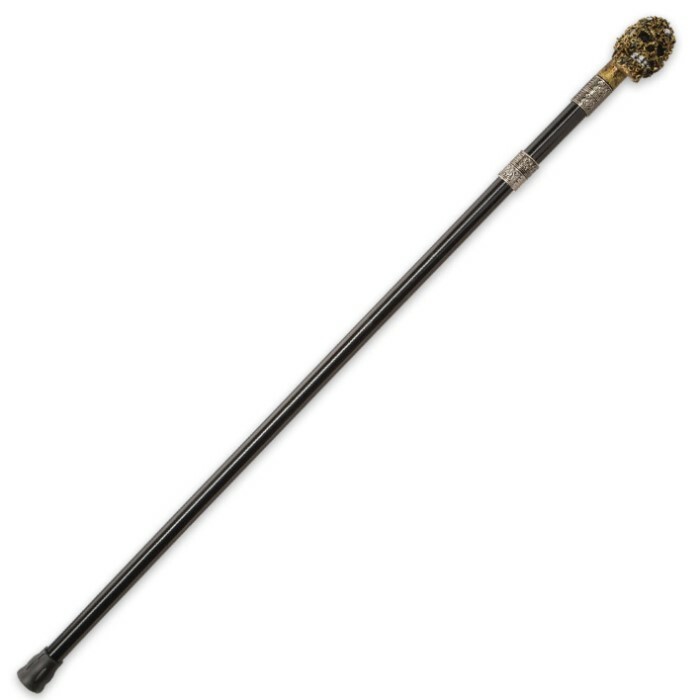 This hip sword cane lets you strut your "steampunk stuff," while hiding a sinister (looking) secret! Tucked away inside this unassuming sleek black walking cane is a menacing 15 1/2" double-false-edged sword blade, forged from resilient stainless steel with a chic brushed finish. Just twist the shaft at the ornately decorated metal alloy collar, and pull to reveal the shimmering blade! 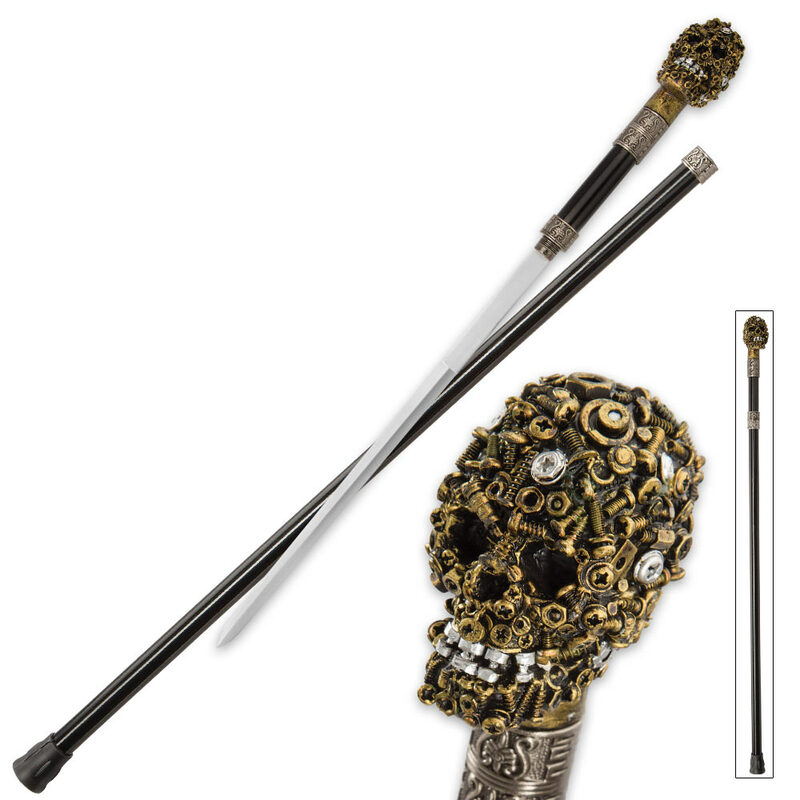 Even if you never brandish the sword lurking inside, this sweet cane is wicked stylish all on its own, thanks especially to "Sprockedermis" - the screw, nut and bolt-covered skull that crowns the cane shaft, serving as a unique handle. 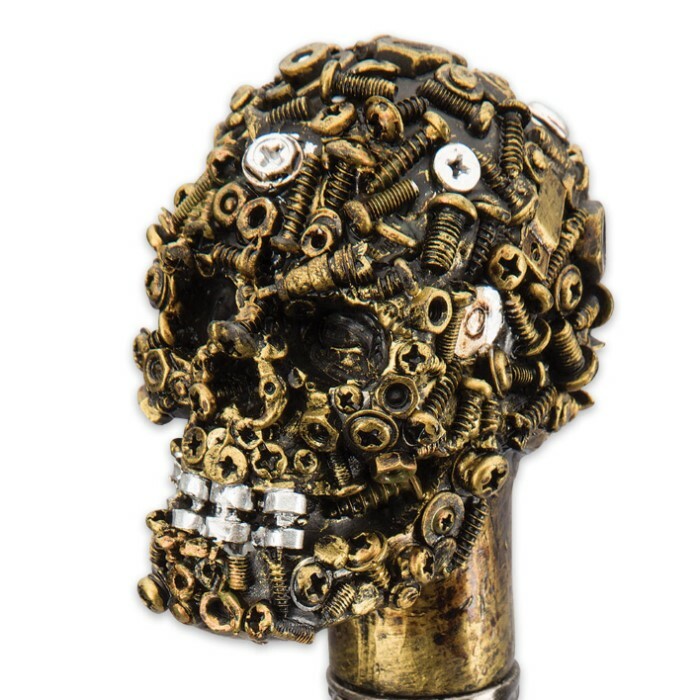 Sprockedermis' metal epidermis is rustic brass-finished, accented with silver-colored screw "teeth." Built to last, the underlying skull structure is cast from a tough advanced resin, and the cane shaft is rugged polypropylene. A rubber toe at the base of the cane provides a skid-free, no-slip footing. The Sprockedermis Sword Cane looks great on display, and it also makes a distinctive fashion statement when paired with your best steampunk duds. Whether you use it to steady your gait or simply show it off, rest easy knowing you've got the coolest cane around! Bought as a gift for our oldest son. He absolutely loves it. Engraving was a nice extra. Good quality. Not sharpened but fine with that. The blade is made out of non sharpened stainless steel and only 13.97 for me so don't expect a war sword out of this. Overall very pleased with it, the design is beautiful and I could still smack the crap out of somebody with it if need be. Definitely worth it for the money.